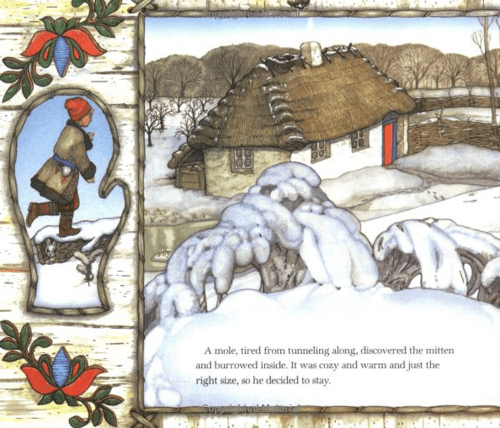 Jan Brett takes a Ukrainian folktale and adds her own ideas to make it one of her most loved stories. After visiting the Ukrainian section of NYC to learn more about their culture, she created her endearing drawings. Since 1989, kids and adults have enjoyed her book, The Mitten. When Nicki, a young boy, asked Baba, his grandmother, to knit him white mittens, she was hesitant. Although concerned that he’d lose them in the snow, she still made them. Sure enough, Nicki dropped one in the snow. While he went about his play, the forest animals found the white mitten. First mole burrowed inside. He scooted over for a snowshoe rabbit that wiggled in feet first. Then they made room for the prickly hedgehog. Not wanting to upset any animal that could hurt them, they let owl, badger, fox, and bear squeeze in also. The mitten swelled and stretched. It was pulled and buldged to many times its size. But Baba’s good knitting held fast. Lastly, a little meadow mouse same and sat on bear’s nose. When his whiskers tickled bear’s nose, bear’s giant sneeze sent the animals flying out of the mitten. Up into the air flew the mitten just in time for Nicki to see it and return home. Baba was pleased that Nicki was safe AND that he had his mittens . . . but she looked puzzled at the size of one of them. F- How does this story make you feel? R- Can you relate to the animals being all snug, tightly squeezed together? When and where have you been with lots of people in a small space? I- Imagine that another animal tried to squeeze into the mitten. What animal could you add? 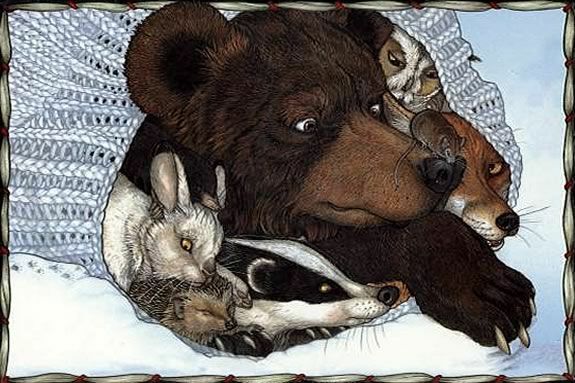 Since Jan Brett ordered the animals by their size as the story progressed, where would your animal fit into the story? N- Navigate your way through the folktale by placing the animals in the mitten as they enter the story. Don’t forget to include the one you added during the “imagine” activity! Please “Like” Kidsbook Friends on Facebook and subscribe via e-mail at http://www.kidsbookfriends.com to receive free kid-friendly book guides to great books! This entry was posted in animals, winter and tagged children's stories with forest animals, G.P.Putnam's Sons, Jan Brett, Penguin Young Readers Group, The Mitten, Ukrainian folktale. Bookmark the permalink. Love the beautiful illustrations. Sounds like a sweet story.